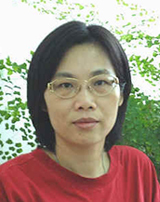 Dr. Yang�s interests are antibody engineering, vaccine development, microbial pathogenesis, and molecular immunology. Research in Dr. Yang�s laboratory has focused on development of meningococcal vaccine. Monoclonal antibodies reactive to a broad spectrum of meningococcal cells have been obtained. Using immuno-proteomic and recombinant DNA approaches, the target antigen for one of the clones was identified to be a novel lipoprotein. This protein, designated Ag473, with no homologues of known function in the database is present in all tested N. meningitidis strains and its vaccine potential has been demonstrated in mouse model. Experiments are engaging to unravel the biological function of Ag473 and its expression pattern during infection because such information will provide important insight into the availability of this antigen as a vaccine antigen in vivo and comprehend our understanding of meningococcal pathogenesis. In the meantime, she will continue to identify and characterize the target antigens for the remaining antibodies which may lead to the discovery of previously unidentified vaccine candidates. 1.Chiang CY, Pan YR, Chou LF, Fang CY, Wang SR, Yang CY, Chang HY. Functional epitopes on porcine endogenous retrovirus envelope protein interacting with neutralizing-antibody combining sites. Virology 361:354-371. 2007. 2.Wiberg FC, Rasmussen SK, Frandsen TP, Rasmussen LK, Tengbjerg K, Coljee VW, Sharon J, Yang CY, Bregenholt S, Nielsen LS, Haurum JS, Tolstrup AB. Production of target-specific recombinant human polyclonal antibodies in mammalian cells. Biotechnol. Bioeng. 94: 396-405. 2006. 3.Yang CY*, Lee YS, Huang LS, Kuo YL, Liu YL, Lu CH. Antigenic diversity of Neisseria meningitidis isolated in Taiwan between 1995 and 2002. Scand. J. Infect. Dis. 38: 273-80. 2006. 4.Lee YS, Yang CY, Lu CH, Tseng YH. Molecular epidemiology of Bordetella pertussis isolated in Taiwan, 1992-1997. Microbiol. Immunol. 47:903-909. 2003. 5.Hung CH, Yang CF, Yang CY, Tseng YH. Involvement of tonB-exbBD1D2 operon in infection of Xanthomonas campestris phage phi L7. Biochem. Biophys. Res. Commun. 302:878-84. 2003. 6.Tsai WJ, Liu JH, Chen ST, Yang CY*. Identification of the antigenic determinants of the American cockroach allergen Per a 1 by error-prone PCR. J. Immunol. Methods 276:163-174. 2003. 7.Chen LY, Williams BR, Yang CY, Cevallos AM, Bhat N, Ward H, Sharon J. Polyclonal Fab Phage Display Libraries with a High Percentage of Diverse Antigen-Reactive Clones to Cryptosporidium parvum Glycoproteins. Int. J. Parasit. 33:281-291. 2003. USA Patent No. 5,789,208 "Polyclonal antibody library"; Granted. European patent No. 1,583,830 "Method for manufacturing recombinant polyclonal proteins"; Granted. ROC Patent No. I 280247, USA Patent No. 10/867,662, European patent No.04015231.6 "Surface protein of Neisseria bacteria"; Granted 2007.